To the right is the gas line that feeds our house. It's tough to see in this photo, but if you look really closely and use your imagination you'll see that the yellow bit bends neatly around the piece of rebar that holds the landscaping timber in place. And to the left is the bit of gas line that was there before the rebar was driven into the landscaping timber. 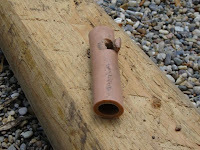 As you might have guessed, the small hole in this piece was caused by the rebar. 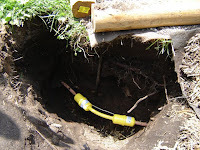 So today I had opportunity to learn: (1) the gas line that feeds our house is plastic, not metal; (2) gas lines, at least in our part of the world, are buried a minimum of 14" deep, not 24" deep like I imagined they might be; and (3) finding a buried gas line (about 3/8" inner diameter) by driving a 3/8" diameter piece of rebar into one's backyard is unlikely, but possible. Wow. You have really good aim. You couldn't even see it under 14 inches of earth. I'm impressed.